This book is a fun book for the reader as it displays a handful of emotions, a bit of quirkiness, perhaps some knowledge, some lessons to be learned and the feelings of pride and commitment. The colorful illustrations provide the perfect visual that definitely makes this story come to life. 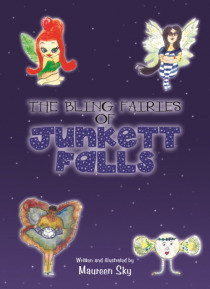 Also, the author, Maureen Sky, created the fairy images from her knowledge of vintage jewelry. Specifically… , vintage Bakelite bangle bracelets (Maureens favorite pieces, I.e. Applejuice, Butterscotch, and Endofday) which allows the knowledgeable reader of Bakelite jewelry, a bit of fun and creative humor while reading the story.